It’s difficult to say what Visioneers is. It’s definitely a strange movie, a black comedy that makes nonsensical risks and takes itself very seriously. It kinda has to in order to work (which it does, marvelously) . 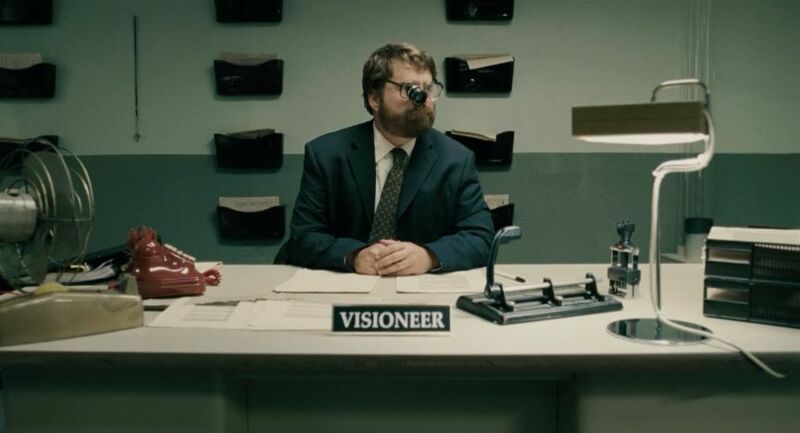 Visioneers takes place in a dystopian world where the United States seems to have been taken over the Jeffers Corporation, a company that promotes mindless happiness via productivity. It’s logo resembles a middle finger, which has become general way of acknowledging one another in this world. People in the Visioneers world who begin to dream and see the horrible situation around them, become stressed and explode. Literally. The film focuses on George Washington Winsterhammerman, played by Zack Galifianakis, who has begun to experience symptoms leading to explosion at the start of the film. His wife Michelle (Judy Greer) is trying to find happiness through a book, his unseen son is a hermit or something, and his brother Julieen (James LeGros) has found peace is pole vaulting. George is a descendant of George Washington and works as a visioneer (I don’t know what that is), where he has a somewhat romantic connection with a coworker Charisma (Mía Maestro pictured above) who he initially only hears, never sees. The acting here is really superb. Galifianakis plays it straight, only succumbing to his natural humor during the Revolutionary War dream sequences where his character becomes the George Washington of the past. He goes as far as being dark in a few scenes, one in particular towards the ends really frightens me. 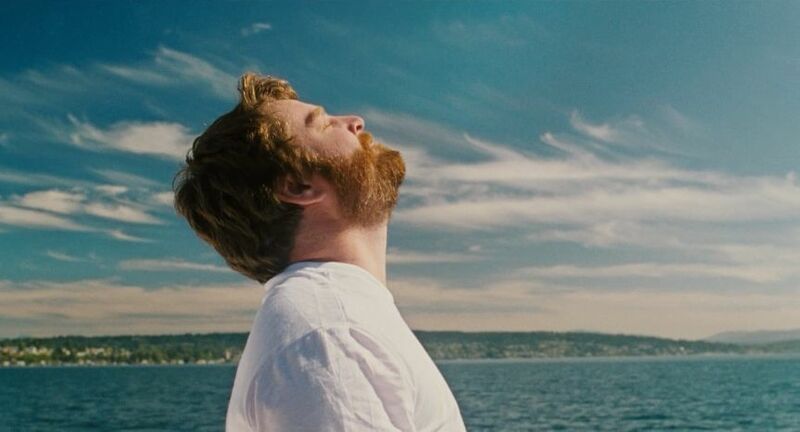 It’s really great seeing Galifianakis stretch his acting ability and have it work out incredibly well. Greer also does this and really steals her final scene in the film, where she delivers a fantastic monologue. She and Galifianakis work so well in that scene that I wish there was more of that in the film. The film deals with various philosophies and how they affect people. The most prominent one in the film is absurdity, which relates the human desire to seek meaning in life despite the human inability to find it. Considering the exploding people, the evil corporation spouting positive affirmations that are instantly sour because of the source, and the tone of hopelessness that much of the film carries; it would seem that Visioneers promotes absurdism. However, there are moments where the film deviates to nihilism and cynicism, both the modern and Greek varieties. There is so much going on that the film comes close to feeling jumbled, but ultimately recovers and finds its purpose. Visioneers is a complex film with so many interesting little things happening that the might go unnoticed the first time you see it. The content is so weird and goofy (employees are called tunts which rhymes with… oh you know), but it is delivered in such a serious way. It can be seen as the beginnings of a humorous 1984, a love story, or even a politial commentary (all of which are alluded to in the film). It all makes for a very worthwhile experience. It is available on Netflix Instant, Amazon Prime Instant, and Hulu, which I have embedded below. I instantly fell in love with the film, I’m sure you will too. 07 May	This entry was published on May 7, 2012 at 6:31 pm. It’s filed under film and tagged absurd, judy greer, visioneers, zack galifinakis. Bookmark the permalink. Follow any comments here with the RSS feed for this post.